It’s that time of year again. Time to tackle that honey-do list and spruce up the place. Yes, it’s time for spring cleaning. But not every task is a DIY project. Take the outside of your house for example. Maybe it got a bit dirty over the winter. Is that something you want to tackle yourself? What about your deck or the driveway? If you’ve got a commercial property, you’ll have even more to worry about. In this case, a pro would be the best solution. But that answer leads to another question: what does pressure washing cost? That’s where we come in. We’ll tell you everything that goes into the price estimate. That way, you’ll know how to find the best deals. It’s the first step to solving any problem: figure out what you need doing. 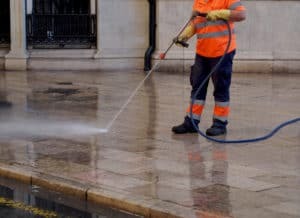 Most power washing companies offer a wide range of services. What you need to be done will determine how much you pay. For example, if all you need is a clean roof, your price should be less than a whole house cleaning. If you do need a whole house cleaning, ask yourself: will a basic wash do or do I need something stronger? Something stronger often means more chemicals. More chemicals mean a higher price. Whoever said size doesn’t matter never had to pay pressure washing cost. Size is everything when it comes to price. Most of the time, professional companies charge per square foot, usually under a dollar. National averages show a price range of $.08-$.18 per square foot for houses. While that price will vary by state, it shouldn’t be too far off. If you get quoted a rate well above it, you might want to switch to a different company. Remember, this price range only uses houses as an example. If you determine you need more than one job done, you’ll have to add in each job. Driveways, roofs, and parking lots are all priced per square foot. You might be tempted to go with the cheapest option you find. But remember, you get what you pay for. Companies with less experience charge less as a way of getting more business. What you need is a knowledgeable company, one that’s efficient, who knows exactly what you need. All of those aspects come with experience. And even when you find a company with those standards, shop around. Research and preparation will always ensure you get the best deal. Getting the best deal on pressure washing job isn’t rocket science. It starts with a simple inventory of your needs. Once you know what you need, figure out the size of the job. After you know the size, find the company with the right experience and know-how. When you do get to that third step, give us a call. We’re Nashville’s premiere power washing pros, in business since 2011. We’ll give you the fairest price while maintaining the highest quality standards.